Matsui Europe, based in Salford, are considered as one of the world's leading manufacturers and suppliers of a full range of casino gaming chips, layouts and live table gaming equipment. As the British arm of The Matsui Group, there are five further sales offices strategically based around the world, with two manufacturing plants in Japan & Korea. Matsui Europe conducted a tender process at the start of 2016, and we were chosen as the winners to design their stylish new website, putting them at the forefront of casino supplies in the UK. The end result is a 100% mobile-friendly and responsive website that shows off their range of products perfectly. 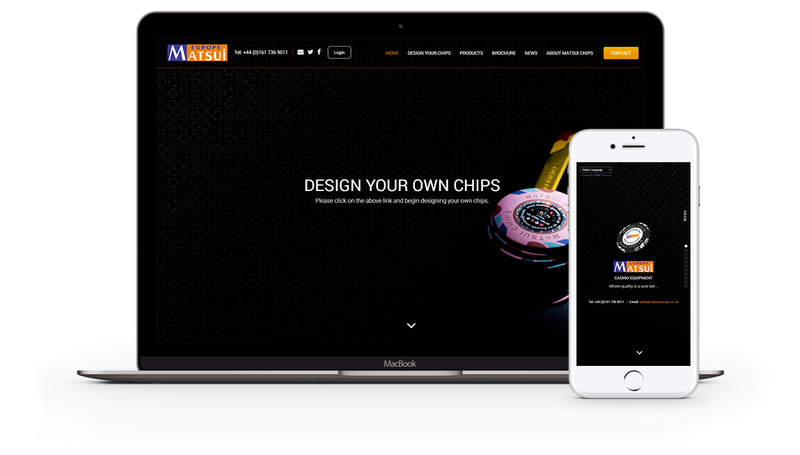 Matsui also specified they would need a custom built “Design your own gaming chips” configurator, and we built this within the WordPress CMS. The configurator allows users to choose from a number of different colour, size and layering options, which they can then order online.